Black Bolt (Blackagar Boltagon) is a fictional Character that appears in publications by Marvel Comics. Black Bolt is the ruler of the Inhumans. His most prominent offensive weapon is his voice, as his electron-harnessing ability is linked to the speech center of his brain. Speaking triggers a massive disturbance capable of leveling a city. Due to the extreme danger posed by this power, the character has undergone rigorous mental training to prevent himself from uttering a sound, even in sleep. 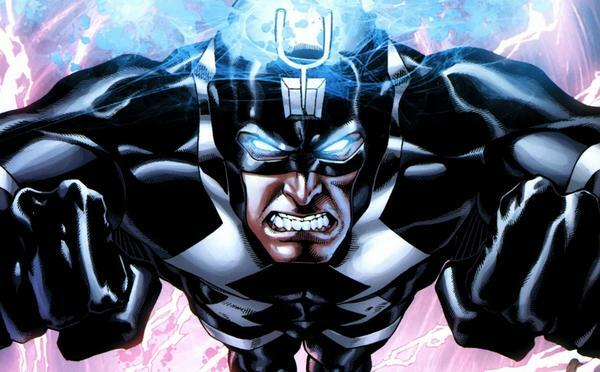 The character of Black Bolt has featured in other Marvel-endorsed products such as arcade and video games, animated television series, and merchandise such as trading cards. More about Black Bolt (Marvel Comics) Character Review - keep reading !! 1960s - Black Bolt's first appearance established the character as being a member of the Inhuman ruling class. The title Thor featured a back-up feature called "Tales of the Inhumans", which recounts the character's origin story. The son of two preeminent Inhumans, Black Bolt is exposed to the mutagenic Terrigen Mist while still an embryo and eventually demonstrates the ability to manipulate electrons. 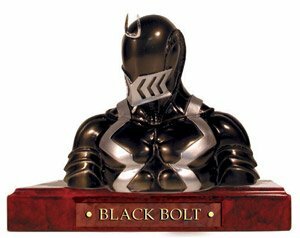 To protect the Inhuman community from his devastating voice, Black Bolt is placed inside a sound-proof chamber and is tutored in the use of his powers. Reentering Inhuman society as a young man — having vowed never to speak — the character is attacked by his younger brother Maximus, who attempts, unsuccessfully, to goad him into speaking. Black Bolt proved popular, and decides to leave Attilan to explore the outside world. The character reappears in a story focusing on his cousin Medusa, drives off the Hulk after the monster defeats the entire Inhuman Royal Family (Medusa, Gorgon, Karnak, Triton, and Crystal), and with the Fantastic Four battles his brother Maximus and his own group of rogue Inhumans. 1970s - After being forced to intercede in the budding romance between the Fantastic Four's Johnny Storm and his cousin Crystal, Black Bolt and the Inhumans feature in the title Amazing Adventures, and battle master villains such as the Mandarin and Magneto. A story told in flashback in the title The Avengers reveals how Black Bolt came to be ruler of the Inhumans and Maximus was driven mad. Black Bolt discovers his brother has secretly allied himself with the alien Kree — the race whose genetic experiments first created the Inhumans — and in trying to stop an escaping Kree vessel overextends his sonic powers and causes the vessel to crash. Several members of the Council of Genetics — including his parents — are killed, with Maximus driven insane by his proximity to Black Bolt's use of his voice. Black Bolt assumes the title of King, but is haunted by the consequences of his actions. The character settles a quarrel between Johnny Storm and the mutant Quicksilver for the affections of Crystal and frees the slave caste of Inhuman society, the Alpha Primitives. Black Bolt and the Royal Family aid the hero Spider-Man against the time-traveling villain Kang the Conqueror, is forced to again battle the Hulk, teams with the Fantastic Four and the Avengers against the threat of the robot Ultron, and again allies with the Fantastic Four against the fifth-dimensional villain Xemu. Black Bolt and the Inhumans feature in a self-titled bi-monthly series battling threats such as the villain Blastaar and the Kree, who regard the Inhumans as abominations. The character encounters the immortal villain the Sphinx — who has defeated the Fantastic Four and the Royal Family — blasts him over a light-year into deep space, aids Kree hero Captain Marvel in preventing a war between the Kree and Skrulls on Earth, joins with Fantastic Four member the Thing to defeat the mutated villain Graviton, and appears briefly during an announcement that Crystal is pregnant with Quicksilver's child. 1980s - Black Bolt revisits his origins when he, members of the Royal Family, and Fantastic Four members Mister Fantastic and the Thing battle the villain Maelstrom. Maelstrom is revealed to be the son of a rival of Black Bolt's father, and after his minions are defeated attempts to destroy Attilan with a guided missile. Black Bolt, however, manages to defuse the missile and Maelstrom is defeated. Black Bolt's search for a new site for the city of Attilan (eventually the Himalayas) is detailed in a back-up feature of the alternate universe title What If, is rated with other powerful Marvel characters by Spider-Man in an "out of universe" conversation with the reader and another back-up feature in the title What If? details how Black Bolt worked with the Eternals to move the city of Attilan to the Himalayas. Black Bolt also directed the eventual move of Attilan to the moon when the pollution on Earth became too much for the Inhumans. The character appears in a graphic novel detailing the eventual death of former ally Mar-Vell due to cancer, humorous parodies of the Marvel Universe in a one-shot publication and the title What If?, and aids superheroine Dazzler against the villain the Absorbing Man. An alien device abandoned on the moon causes Black Bolt, the Royal Family, and the Fantastic Four to experience nightmares until destroyed by Triton. The character is imprisoned by brother Maximus (who has also swapped their bodies) but later freed by the Royal Family and allies the Avengers, appears in a one-shot title detailing several of Marvel's continuity mistakes, is married to cousin Medusa (after an interruption - a battle between a Kree and Skrull soldier), and appears in a back-up tale in the title Marvel Fanfare. With the Royal Family, Black Bolt encounters Dazzler once again, appears in flashback in two titles, attempts to subdue an erratic Quicksilver (distraught over his wife's affair), and aids the mutant team X-Factor in defeating Maximus. The Inhumans then assist the Fantastic Four against the villain Diablo, skirmish with a later version of the team during The Evolutionary War, and appear in the second volume of the title What If ? Black Bolt clashes with Attilan's Genetic Council when he conceives a child (Ahura) with Medusa, destroys the alien symbiote that Spider-Man bonds with in another issue of What If?, and with the Royal Family encounters the hero Daredevil. 1990s - After another appearance in a back-up feature in the title What If? a story told in flashback reveals how Maximus, using a creation called the Trikon, forced Black Bolt from Attilan. Black Bolt, however, eventually defeats the Trikon and regains the throne. After aiding the teen super group the New Warriors the Royal Family joins forces with X-Factor to stop master villain Apocalypse. Black Bolt makes a series of brief guest appearances in several titles and his child is threatened by rogue Inhumans. After two more appearances in back-up features in the titles X-Factor and Starblast, Black Bolt appears in several panels in two titles before starring in the one-shot publication Inhumans: The Great Refuge (May 1995), which details the Inhumans ongoing battle with the Kree. With the Royal Family, the Fantastic Four, and Doom's heir Kristoff Vernard, Black Bolt thwarts Maximus again and appears with the Fantastic Four during the Onslaught crisis. 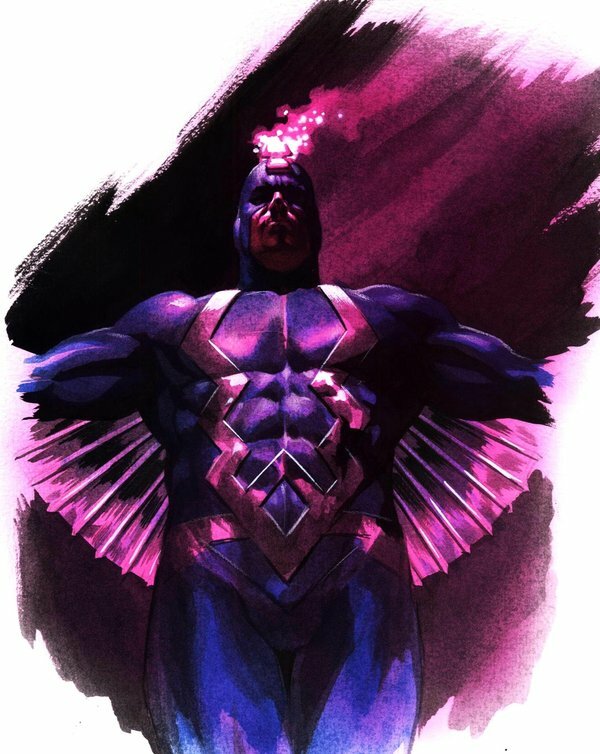 After appearing in the one-shot title Bug Black Bolt and the Inhumans feature in the Heroes Reborn universe, where they worship the entity Galactus and his Heralds, as gods. The character encounters the noble savage Ka-Zar and witnesses Quicksilver reunite with Crystal before he and the Royal Family appear in a back-up feature in the Fantastic Four title. Black Bolt and the Inhumans then feature in a self-titled limited series which deals with the "coming of age" of a new group of Inhumans and stopping Maximus, who with both human and Inhuman allies attempts to subvert his brother's rule. After an appearance in the final issue of a Quicksilver limited series Black Bolt and the Inhumans team with Canadian superteam Alpha Flight. 2010s - He in fact survived the explosion. It was revealed that Black Bolt likely represents the anomaly of the Kree Inhuman genetics program that had been predicted hundreds of thousands of years ago. The genetic prophecy was that this anomaly would bring about the end of the Supreme Intelligence. To prevent this outcome, the Kree Supreme Intelligence had ordered the destruction of all the worlds where the genetic experiments took place. Only five colonies escaped, including Earth's: these were the Universal Inhumans. 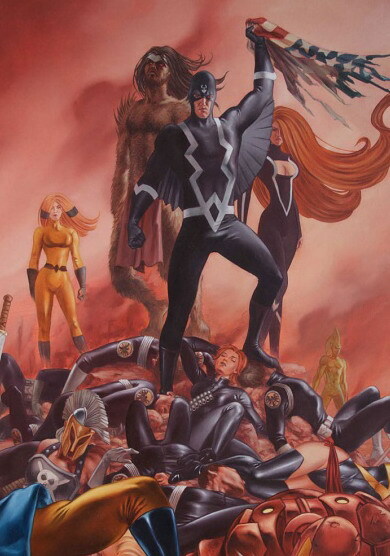 After his return to Attilan, Black Bolt joined the Universal Inhumans and was presented with four new brides, one from each of the other colonies. They returned to Earth to help defeat the last four Reeds of the Interdimensional Council. They then faced the Kree Armada, who had been ordered by the resurrected Kree Supreme Intelligence to wipe out Earth and the Inhumans. After the Kree fled in defeat, the Inhumans followed in pursuit..
Black Bolt's Terrigen-mutated physique surpasses the superhuman physique of typical Inhumans: his strength, stamina, durability and reflexes are all well above typical Inhuman or human levels. His speed and agility are also highly enhanced. An organic mechanism in his brain's speech center produces an unknown particle that interacts with ambient electrons, enabling him to produce certain mentally controlled phenomena. The most devastating of the effects is Black Bolt's quasi-sonic scream. Because his electron-harnessing ability is linked to the speech center of his brain, any attempt to use his vocal cords triggers an uncontrollable disturbance of the particle/electron interaction field. Because of this limitation, Black Bolt must be constantly vigilant of even the softest of utterances lest he destroy anything or anyone in its path. At full strength, his voice generates a shockwave equivalent to that of a nuclear weapon, while a whisper can rock a battleship. 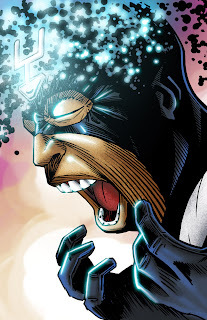 When Black Bolt was captured and experimented on by the Skrulls, it was shown that his "Sonic Scream" is triggered and at least partially dependent on his emotional state. 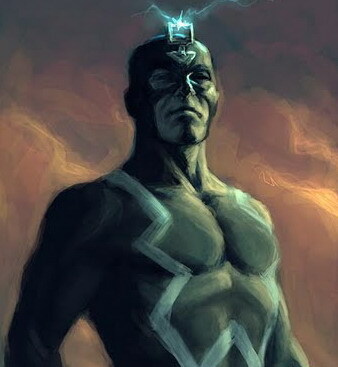 The fork-like antenna worn upon his forehead helps Black Bolt control his powers. He can channel his powers inward to increase his strength and speed, and can focus it through his arms as concussive blasts. Black Bolt is capable of channeling all available energy into one devastating punch called his Master Blow, which renders him extremely vulnerable subsequently. By concentrating his electrons into anti-electrons, he can fly at speeds up to 500 mph for a period of 6 hours, protected by an anti-graviton field. Black Bolt can create a nearly impenetrable force field by focusing his energy around himself, and can use his electron abilities as extrasensory probes, highly sensitive to electromagnetic phenomena, and he can also jam certain electromagnetic mechanisms. Though exhausting, he can create particle/electron interaction fields solid enough to be traversed upon. 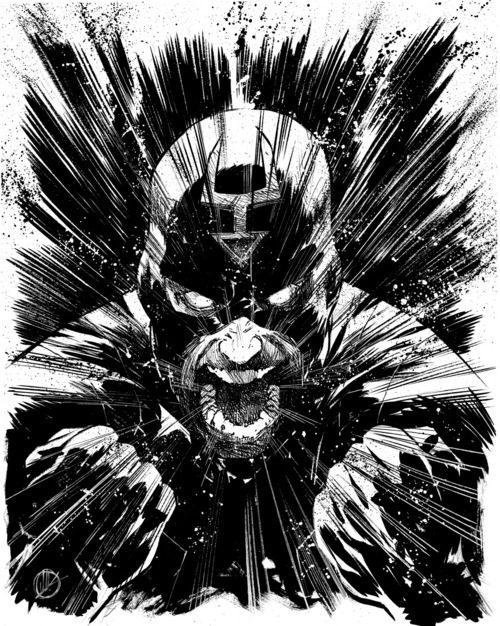 Black Bolt also is at least partially resistant against telepathy and shares a semi-telepathic bond with those of his blood (such as the Inhuman royal family and certain others), as was evident when he was able to resist the mental abilities of his telepathically powerful brother, Maximus, and on different occasions, use his own abilities to overpower and take control of Maximus' mind. 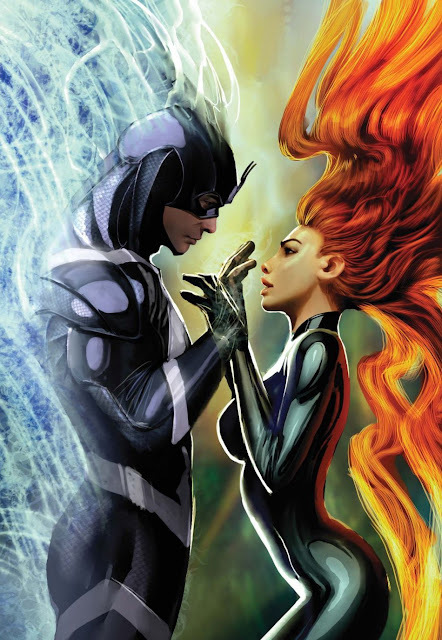 One of Black Bolt's main uses for his telepathic ability is to communicate his wishes to his wife, Medusa the Queen, who then acts as his mouthpiece to the rest of his subjects. He can also use this limited telepathy to communicate his destination wishes to the royal family's teleporting dog, Lockjaw. Black Bolt alongside the other Inhumans appeared in the Fantastic Four episode "Medusa and the Inhumans". Black Bolt appeared in the 1994 Fantastic Four animated series. KISS bassist Gene Simmons said on an episode of his television show Gene Simmons Family Jewels that he is a big comic book fan, with Black Bolt being one of his top favorites. The bat-like "wings" that are part of his Demon persona costume were thought to have been inspired by Batman, but when asked by his son Nick, he said that they were modeled after the similar wings worn by Black Bolt as a tribute to the comic book hero.